Do you battle with the removal of stubborn spots, water streaks and dust build-ups from your windows? Do they cost you too much effort and you don't want to take part in this household task? This process will no longer consume a lot of your time and energy! The experts of window cleaning in Oakwood will render you assistance! You will be able to use your free time as you wish – the fully instructed and reliable experts will deal with the sweeping and scrubbing. We provide impeccable cleaning services for all kinds of glass surfaces. Read on and discover more about the different benefits you can enjoy. We also provide our professional services in nearby areas: Trent Park, Hadley Wood, Enfield Chase, East Barnet, Osidge. The specialists of commercial window cleaning will provide you with excellent service for your work environment. We can reach up to the fourth floor of your building with our water-fed pole system. If you have windows higher than that, we will perform the cleaning with the help of our rope access equipment, designed specially for difficult to reach glass panes. All things considered, you can rely on us for rigorous window cleaning of all business property kinds - from small shops to the towering office buildings in London. We are glad to use the latest strategy to make sure that you get the optimal window cleaning. The glass surfaces of your building are going to look spotless after we use water-fed extension pole cleaning system and high pressure cleaning on them. We use our vehicles to supply the poles with water and we can reach as high as the fourth floor. In case you require cleaning of windows on taller buildings than that, we have rope access team ready to go. Call us on 020 3746 3113 and get in touch with us – these effective techniques will bring you results right away. You can always depend on our workmanship and devotion for residential and business window cleaning. Our abilities allow us to clean all types of windows you could have at your property. For example, you can book cleaning of single or double windows, French doors, sash windows, bay windows and patio doors. Moreover, we include conservatories and roof windows as part of our practice. So to speak, you can enjoy the good look of your windows with our timely and trustworthy services. 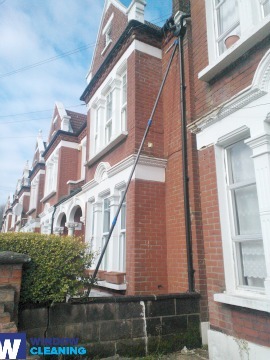 Take advantage of our domestic window cleaning in Oakwood – we provide great services for your home on attractive prices. We use purified water to clean the windows thoroughly. We clean from the ground with water-fed pole system. Find us now - call 020 3746 3113 or just use our booking form. Our representatives will help you request a window cleaner and answer all of your questions. You will appreciate the results of our household services, we promise that!